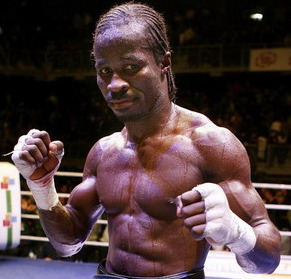 Belgian jr middle "Sugar" Jackson Osei Bonsu (pictured) was as previously reported stopped in two by Frank Haroche Horta March 29 but was lined up to defend the EU title against Giuseppe Langella May 31 in Antwerp. However, Jackson was injured in the Harroche Horta fight and will be sidelined for at least two months. He has thus relinquished the EU title which will now be contested by Giuseppe Langella, 19-8-3, and Orlando Fiordigiglio, 15-0, June 14 or 28 in Arezzo, Italy, with Boxe Loreni promoting. The winner has agreed to fight Osei Bonsu at the same conditions that was set for Jackson vs Langella May 31 in Antwerp. The big question is of course if the former EBU champ can come back. It wasn´t long ago that "Sugar" Jackson was on the verge of a big breakthrough at world title level but he appears to have faded a long way since.